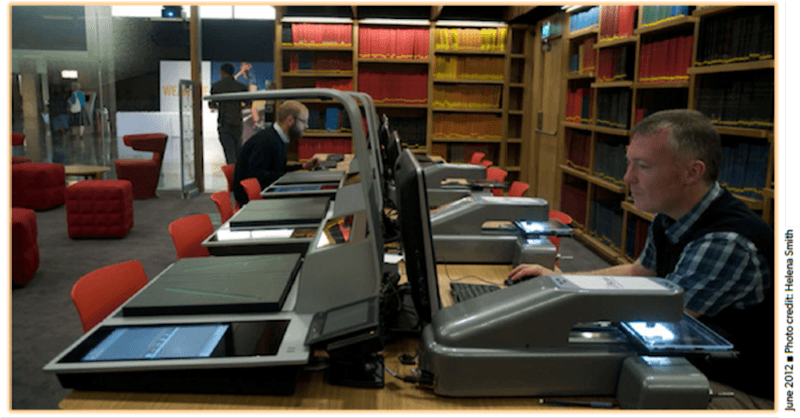 Libraries, universities, and other organizations with historical archives are expanding their research offerings and going green with modern self-serve equipment for their patron scanning. Companies like Zeutschel and the Wicks and Wilson division of the Crowley Company have great products like the Zeta Book Scanner, Crowley Overhead Document Scanner/Copier, and the W&W UScan Multi-format Scanner which handles microfiche, roll film and aperture cards too. These walk-up devices provide the ability to not only view and print historical information, but also to digitize and save the content to a local USB or flash drive; printed to hard copy; or output to cloud, CD/DVD, and email—all in color, grayscale or bi-tonal. Read about one university that went green and saved $$ with a Zeutschel Book Scanner. with the UScan+ Multi-Format Scanner.